Save A Life – Share This Post!!!! 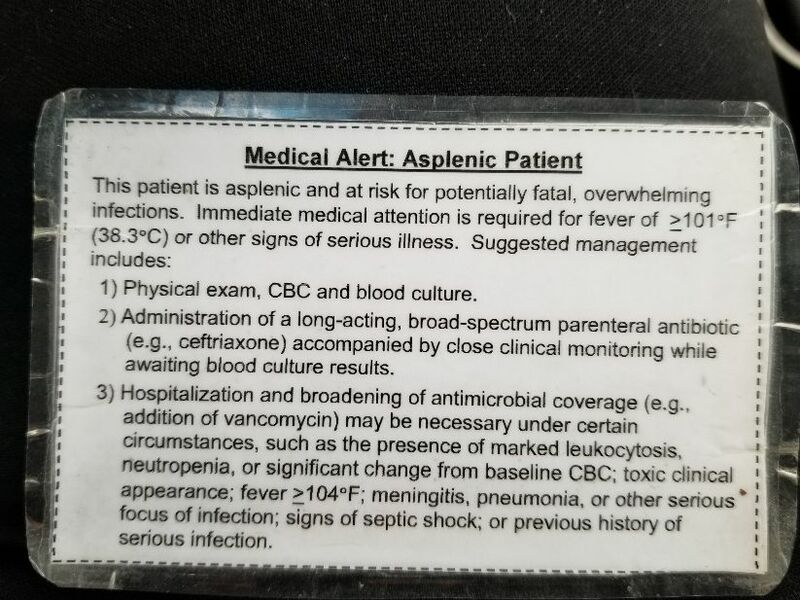 These are copies of a laminated card I carry in my wallet, and reflects the warning on my med-alert bracelet. I am asplenic, in simple words, I have no spleen. Like many others, and for any reason besides cancer, a person could be left without a spleen. And if that is the case, that means that you are at an increased risk for infections and illnesses, including developing a fatal condition related to sepsis, which I have dealt with twice. And were it not for this card, and the quick thinking of my doctors, I may not be here today. 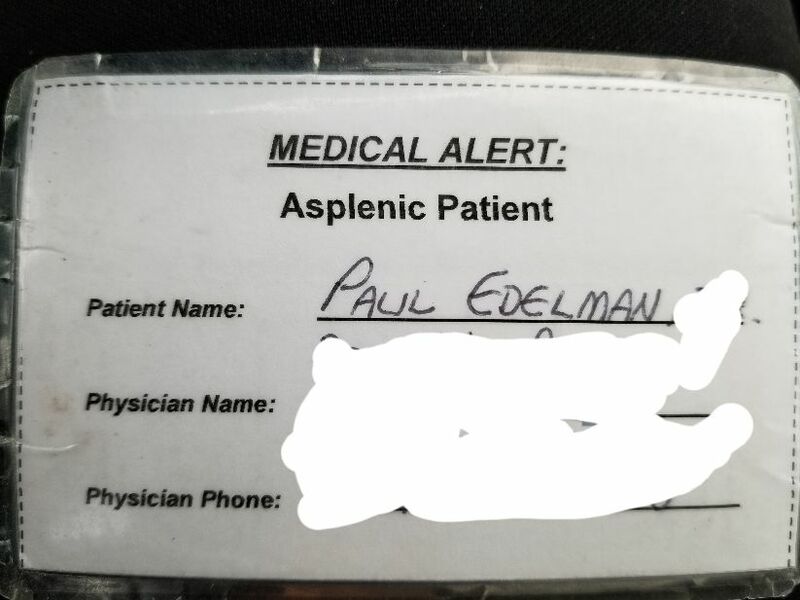 I am a member on many pages related to Hodgkin’s Lymphoma, but as I stated, being asplenic is not just related to cancer. Trauma such as a car accident, another illness, could result in the loss of your spleen. And the chances are, that you know at least one person in your life, without a spleen. And if you do, this information will help to save their life. I received this information over ten years ago, when I met the doctor who is dealing with all the late side effects from my cancer treatments. This information is given out by the survivorship clinic at Memorial Sloan Kettering Cancer Center, so this is information that is very important, and proven. Please share this post, encourage the printing of this card, or even typing it yourself, but keep it. If you end up with a fever over 101 degrees, get to the emergency room. They need to check your lactic levels which will either confirm or deny sepsis. With sepsis, it is a matter of hours of saving your life. The more knowledge and tools you have, the better chance you have. Over the last decade, I have known too many who have died from sepsis. Patty Duke, former child TV star, died from sepsis. The attention to sepsis lasted only days, yet every day, so many patients face sepsis, and unknowingly, pass away with the cause not determined, likely to have been sepsis. Timing is important. Share this post. If you know someone without a spleen, give them this information. They will be glad you did.